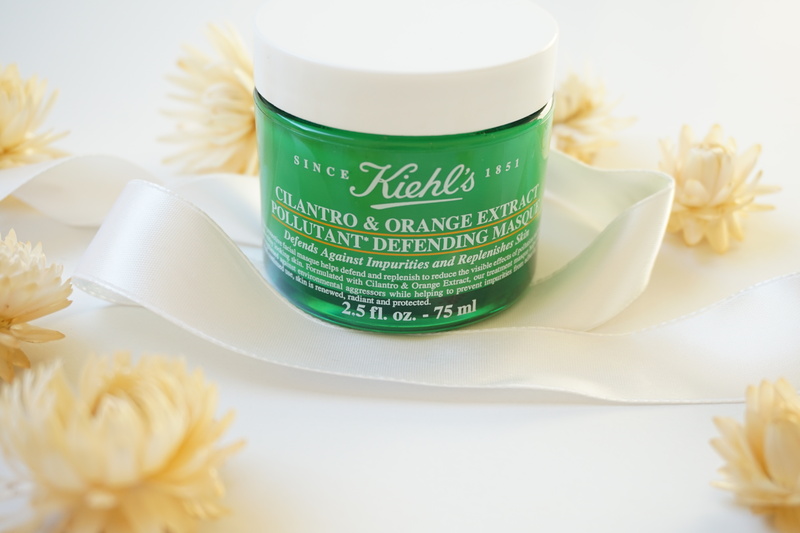 If you followed me for a while, you might have seen my previous review about the Kiehl’s Energizing Radiance Masque. I purchased this mask by myself because I started to get curious after the many good reviews. Currently I am loving this mask! I used it three times and everytime my face looks radiant and energized (just like the name of the mask!) and it feels so soft! My moisturizer and foundation application feels different after I use this mask, which is a good thing. Beside my blog I also own an Instagram account. 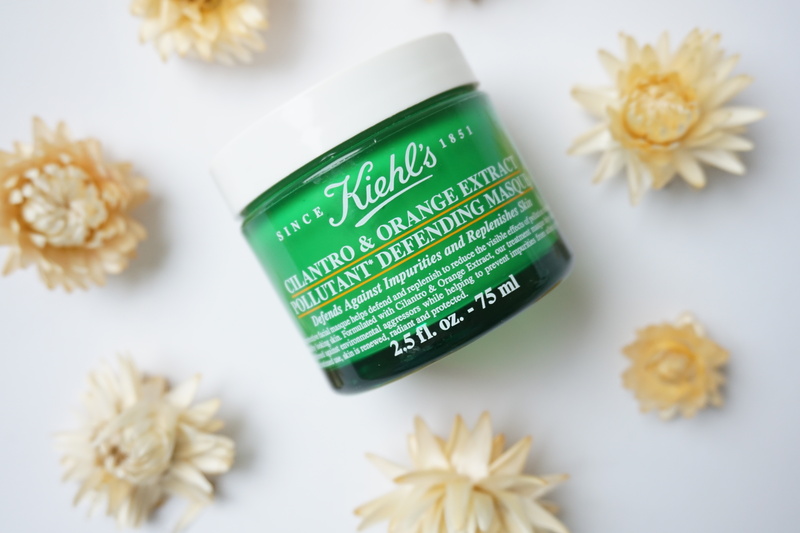 After I placed my Kiehl’s review on my Blog, I posted a picture of the mask on my Instagram. As usual I use all kinds of tags to make sure that people will find my picture. Never did I expected or hoped or imagined that Kiehl’s NL themselves made contact with me after I placed my Instagram picture. They read my review and saw that I wanted to try out the other mask that was released. Again, what they asked me next was something I never expected in the first month after I started my blog and Instagram. They offered me to try out the Pollutant Defending Masque. Of course I said yes and I thanked them for this opportunity. This is the mask I received! The jar came along with these beautiful dried flowers, which I now use for almost every Instagram picture as decoration (double thanks Kiehl’s NL!). The Pollutant Defending Masque is a mask that defends and replenishes your skin to help reduce the visible effects of pollution. It helps against the environmental aggressors while helping to prevent impurities. The ingredients are orange extracts and cilantro. 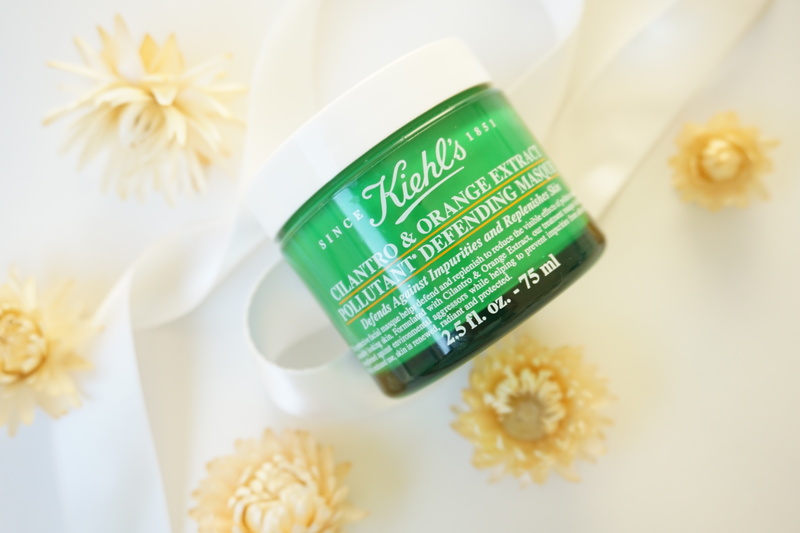 The orange extract contains strong antioxidants that blocks damage-causing pollution that is attached to your skin. The cilantro extract helps to strength the skin barrier and to keep it replenished and hydrated. Supplied with essential nutrients often depleted by pollution damage. 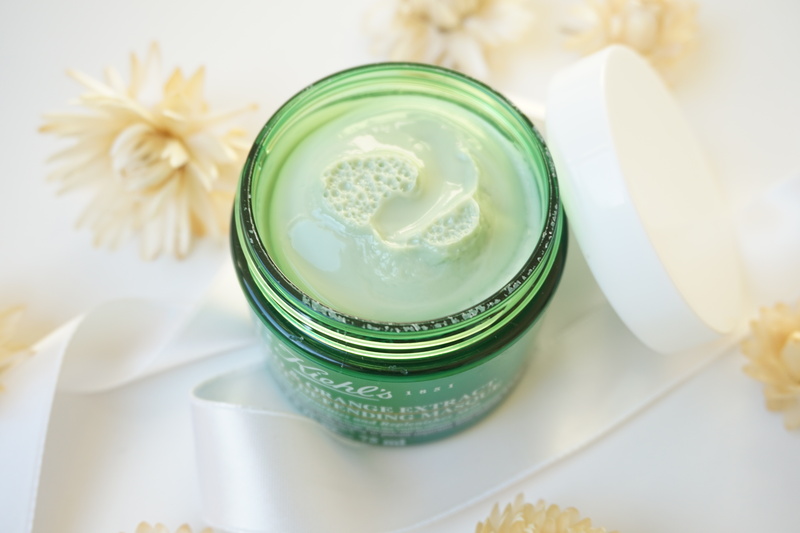 This mask is a tisseu-off formula: you apply a visible layer on your skin and let it sink in for 10 minutes. After that you remove the layer with a tissue and let the remainder of the mask on your face and tab the residue into your skin. Use it as a leave-on mask during your sleep and wash your face the next morning. When I first used this mask I was expecting the same consistency as the Energizing Radiance Masque, but this was totally the opposite. This mask is smooth and has no ‘pieces’ in it. With the other mask I was doing my best to massage the Cranberry seeds on my skin, I wanted to grab every piece of seed and use it good. With this mask you don’t have this problem. You just need a little amount (I used the scoop spoon which usually comes with a moisturizer jar) and my whole face was covered. This mask doesn’t dry out on the skin, it actually hydrates the skin while you wait. I applied the mask without any problem, I wiped it of with a tissue after 10 minutes. This was a little bit difficult for me because I did not know how much I had to remove of the skin. Other leave-on masks only have one step and that is just to apply the mask and let it sink in. 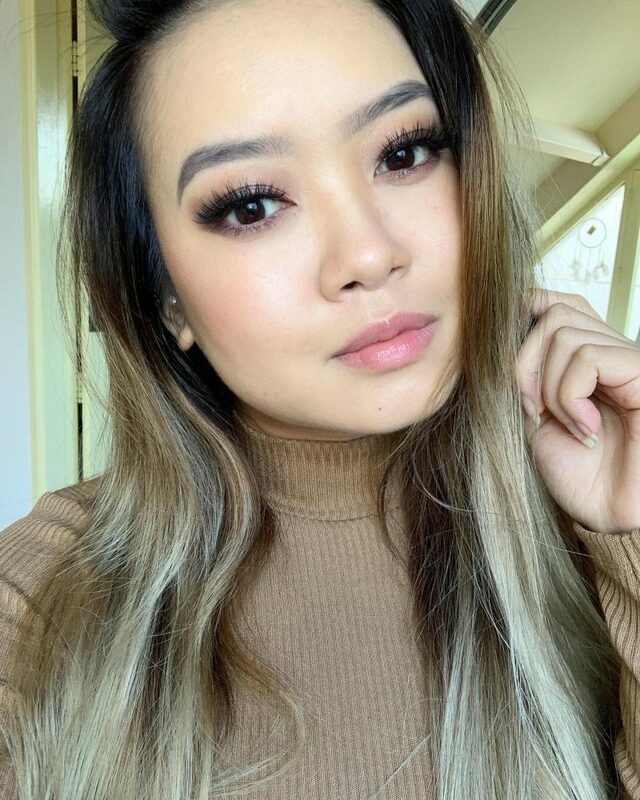 So I just left a small amount of product on the face and I tapped it into the skin. So I applied it, wiped it of, and now it was time to go asleep and let the residue to its job. I tried many leave-on mask, but this one was a bit sticky. Maybe because I did not know much I had to wipe of so I just let a random amount on my face. So the next morning I do my morning routine and wash of the mask. I immediately noticed that my skin was so soft! My face had an even complexion and it looked like I had slept for 12 hours (I only sleep 5 hours during the weekday). They say when you continue using the mask, your skin will get renewed, less dull and more radiant. I did not use this mask for a long time so I can’t tell any difference now. Overall I think this mask works great for my sensitive skin. I saw a big difference after one use but I am more thrilled when I use this mask on a regular bases and to see if my skin looks more renewed. I think I need to wipe of more products before I go to sleep so the product can sink into the skin without leaving a sticky feeling. The price/amount ratio is reasonable since you only need a small amount to cover your face. But to be honest, I like the Energizing Radiant Masque more. I think I am not the only one because a lot of other bloggers are raving more about this mask than the other. Personally I think because the other mask has a different consistency which feels more pampering when you massage it of. But still this is a very nice product and definitely worth at least a try! Oooo! Looks so good! I really want to try this! I reccomand the orange jar!! They just launched a few months ago, but a lot of bloggers are raving about the orange jar! I am more excited about the Energizing mask, but you really need to use it a few times before you notice like really improvement. ???? I think they released it 2 months ago! They just came with a new item, an exfoliator to use at night. It is in a green bottle, you need to see that!